Just me, my man, the open road and plenty of adventures along the way. So much so, I need to split the holiday up into four different sections on the blog – including ; California, New Orleans, Miami and the Bahamas and New York City. Welcome to the first installment – CALIFORNIA! The state of sun, fun and wine! We flew into San Francisco and this is where our adventure began. We stayed at The Palace Hotel which was one of the most stunning hotels I’ve ever walked into. Chandeliers hung from the ceiling and fresh flowers were everywhere. There was even live music in the dining area with a fabulous pianist and operatic singer. After exploring the usual scenic spots, Fisherman’s Wharf, bike riding over the Golden Gate Bridge and enjoying sunset drinks on the top floor of The Intercontinental we were hiring a car and setting off on the open road. After an adventure filled few days trekking Yosemite by day and sitting on our patch of farm drinking ciders by night it was on the road again for us but this time heading for wine country, Napa Valley. While I loved walking 25 kilometres a day – up hill in Yosemite – I was pretty excited for a change of scenery as white wine, red wine, champagne and my personal favourite rose, were all going to be on the menu. FISH-BOWL SIZED GLASS READY! 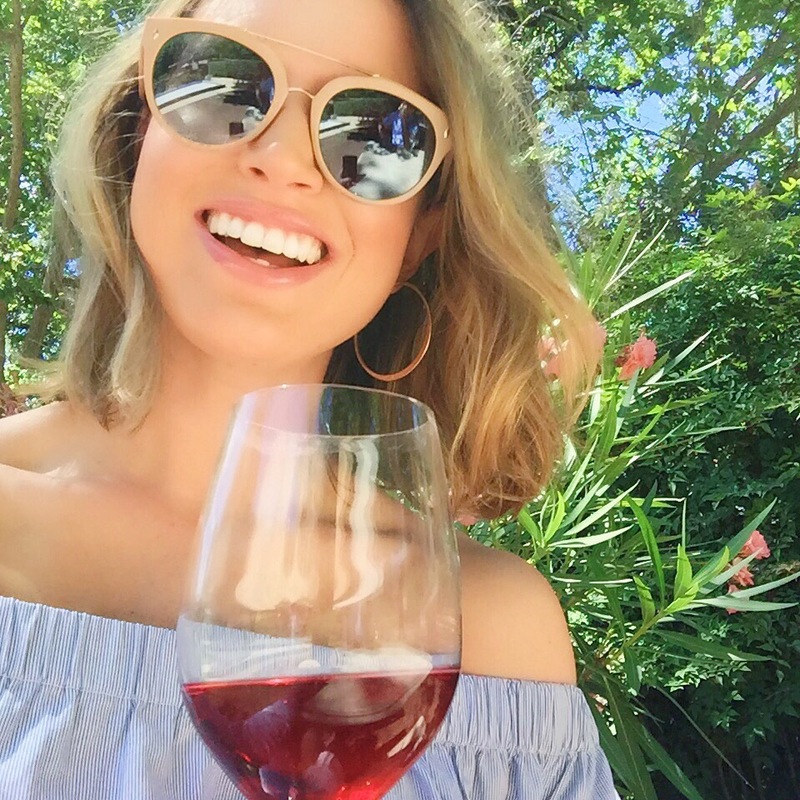 Napa Valley was exactly like you imagine it to be. Similar to the Hunter Valley but HOT! It’s all about going from winery to winery and sampling as many wines as possible. One of my favourite wineries was Beringer, it looked like something created from a dream-like fairy kingdom with an abundance of blooms everywhere and heavenly tasting wines! It’s also nice to stop off and have a beautiful lunch along the way. Farmstead had great reviews online and we weren’t disappointed. From paddock to plate, the food and wine at this hot spot in St Helena was spot on. Of course I snuck in a cheeky Mac N Cheese for the table. It was literally my American obsession! All in all, simple food, done well. Another winery where you really get value for money is Moet Chandon. It’s $20US for 4 (really full) tasting glasses and they have some beautiful table settings scattered on the lawn where you can sit and watch the afternoon pass you by.